Check out the calendar page for links to each event. It will be a long while before I can do this again, so if you’re close, please come out! 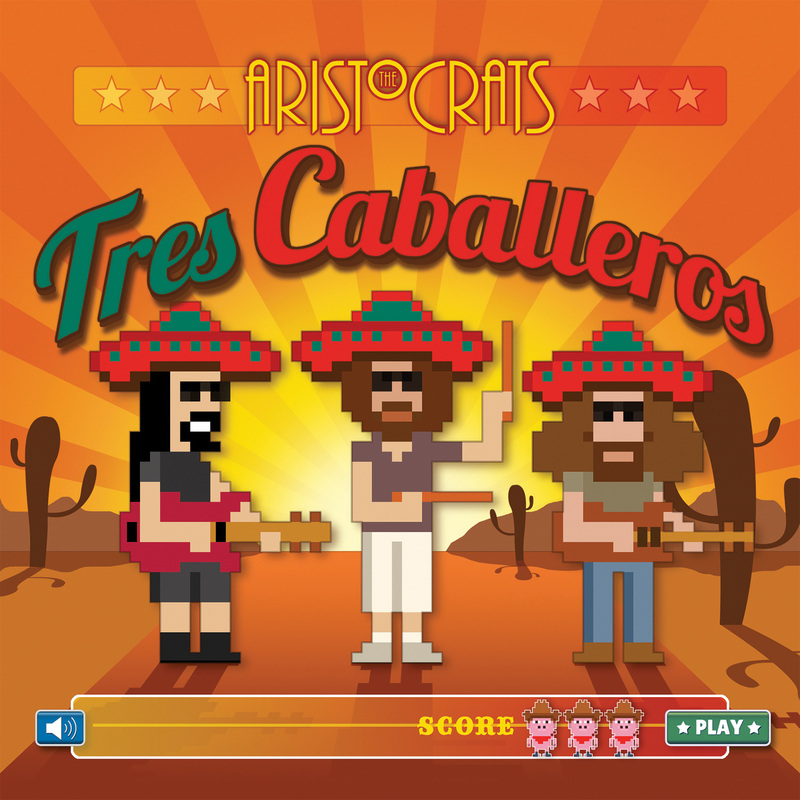 And now for some more Aristocratic hype: We’re now less than a month away from the June 23 release of The Aristocrats’ third studio album Tres Caballeros, which means it’s time to roll out some more previews! So click here for a new preview montage of the entire album, hosted by our friends at Guitar World Magazine. Massive thanks to those who have pre-ordered already! Wise move – you’ll get a free digital download of the album (with a link that becomes active at midnight June 23 local time) with any CD order (both standard CD-only edition, or deluxe edition with bonus DVD containing tons of extras). In case you haven’t, click here to join the party. Remember, here’s the track listing for the album. Can you match up the montage bits with the song titles? And some North American summer tour news: We’ve just added a second date at Reggie’s in Chicago on Thursday July 23! Don’t forget to check out the Aristocrats’ Tours page for all of the latest information and ticket links for our July-August Tres Caballeros tour of the USA and select parts of Canada, plus one date in Mexicali, Mexico. Ok, off to Des Moines, Iowa! The Aristocrats’ “Tres Caballeros” Available For Presale Now – Watch The Exclusive New Preview Video! And here we go: After nearly two years since Culture Clash was released, The Aristocrats are proud to share some new music with you, and announce that our third studio album Tres Caballeros is now available for pre-order! There’s a 5-minute YouTube trailer video previewing the new music, as well as some video footage from the bonus DVD in the Deluxe Edition, available right here for your viewing. Tres Caballeros will be released in a Standard Edition (CD) and Deluxe Edition (CD/DVD), which will include a 30-minute documentary featuring live and in-studio footage, outtakes, demos, and more. 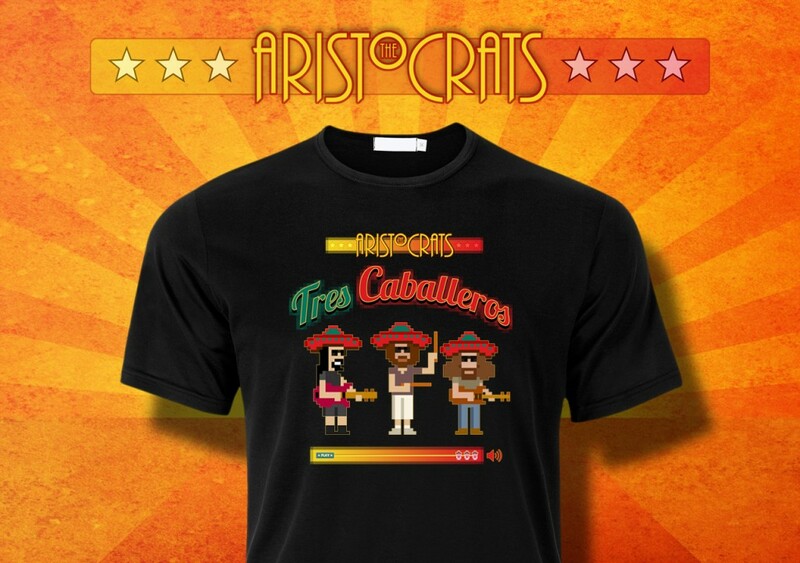 If you order from The Aristocrats’ webstore, you’ll find an exclusive Tres Caballeros t-shirt is also available, in all of its 8-bit glory. The release date is June 23. We’ll have more previews leading up to that date. For now, I hope you dig what you hear, and feel inspired to spread the word on social media and beyond to like-minded folks. I know we’ve been talking about this for a while, so I’ll take it easy on the hype and stick with the facts. Ok, a little hype: I’ll have a couple of really cool things to show you leading up to the release date in June. You’ll see. For more constant Aristocratic updates, don’t forget to check out our Facebook page and follow us on Twitter and Instagram. Lots of stuff is showing up there on an almost daily basis. Of course, I’m on Facebook and Twitter and Instagram as well, just as me. Once again, thanks for your patience as this all came together. I can’t wait for you to hear the whole thing.